This notebook caught my eye this week as it is exactly how I'm feeling as of late. I'm putting together a rather big project for Sweet Peach that will be revealed in the next week or two and I have a few people around me that are giving me so much of their time and passion. They believe in the project as much as I, and for that I feel incredibly grateful. Finding this notebook led me to this sweet little shop today. Megan Smalley and Leslie Allen of Auburn, Alabama have combined their talents and vision to create an online print shop that offers stationery, art and a bit of home decor. They describe their work as 'tasteful simplicity' and that's exactly what I like about it. I always search for note cards that have that characteristic but they are sadly few and far between. 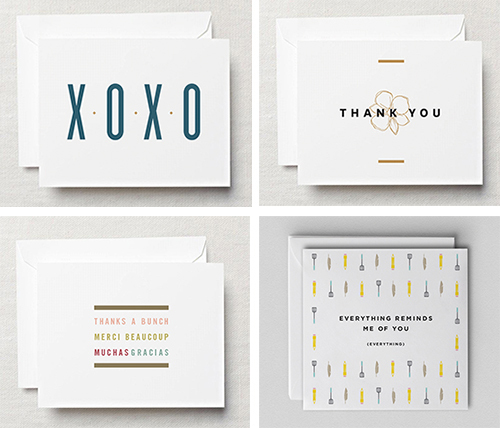 A plain Thank You on a white card shared in a pretty way is all I need. I admit I smiled wide when I saw their placemats. It was unexpected. I immediately thought of when I was a kid as I would of loved to have these placemats to write down my mom's menu each night, along with all of our names in different colors and fonts. I'm the youngest of four and I can't even tell you how many days and nights I would do arts and crafts and dream up plays, commercials and fake newscasts. I particularly loved creating presentations for things... and still do now. I suppose it's good to not (quite) grow up. There is much more to Scarlet & Gold then I've shared here so please check out their site to peruse a bit more. It's simple, sweet and tasteful. And for that, I am grateful.